These photos were obtained via a google search with pirouge and madagascar. It is hard to know whether some of these craft are proas that shunt, or whether they are tacking craft. 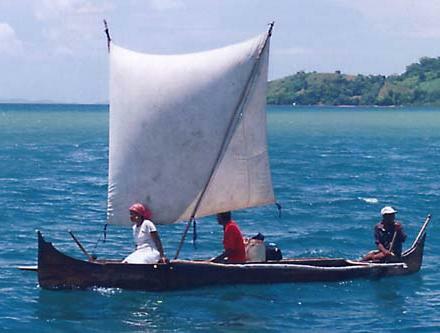 Some seem to have the outrigger as a float and others as a counterweight, suggesting a tacking craft, though some seem symmetrical fore and aft, suggesing a shunting craft. 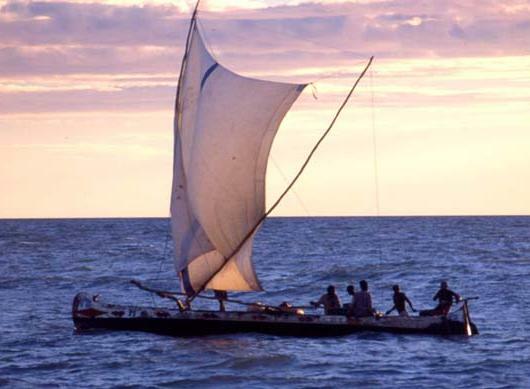 It may be that the same craft can do both things, and the crew chooses to tack when the leg is short or when the wind conditions suit having hte outrigger as a float. More recent thoughts are that these craft are most definately tacking craft, not shunting. Evidence of this is that the bow and stern are slightly different, with the bow being more rounded in profile, like the canadian canoe, and with the stern more vertical in profile. Additionally the two spars are located on the forward crossbeam. My thinking is that although the ends are different, they are not markedly different. 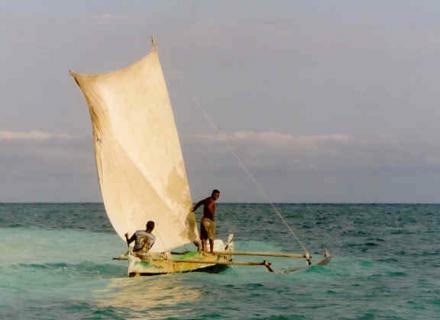 Hence should the crew want to go on a long trip and prefer the outrigger to windward, it would be straight forward to move the rig to the aft crossbeam, and go stern first. My guess is that this would not be bothered about in a short trip, but for a long trip this is plausible. This idea of changing ends as per proa is purely speculation and not based on any evidence whatsoever. The rig confused me for quite some time. 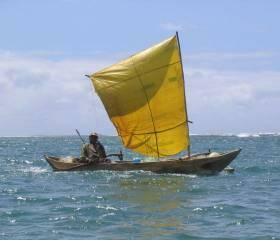 Eventually I deduced it was a sprit rig, but the front spar is not attached to the luff of the sail. If you look at the YouTube video you can see that sails being adjusted to go downwind. There are two types of rig used. One is the modified sprit rig as desribed just previously, and the other is a lateen rig. 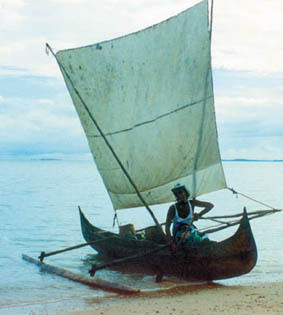 This modified sprit rig is very commonly used in proas (fishing boats) in Sri Lanka. 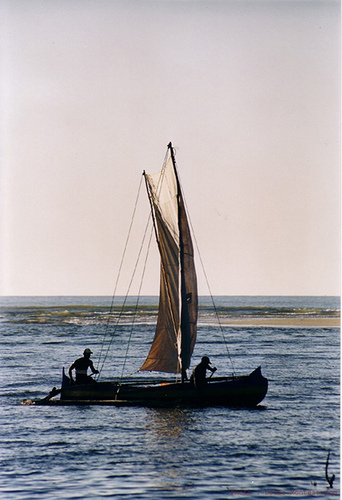 However in those craft the spars are placed in the center of the boat, and the craft is shunted. It should be noted that as the luff is not tight on this sort of sprit rig it cannot point as high as some other craft. In Sri Lanka this is not an issue as the wind is from a steady direction. The proas there reach out going 90 degrees to the wind, they then reverse direction and go back to shore. 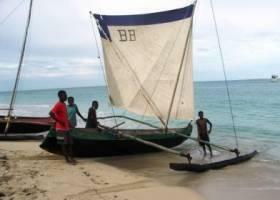 Some of these tacking outriggers from Madagascar use the lateen rig. My guess is that these craft would point a little bit higher than the craft that use the sprit rig. One very obvious feature of these craft, is that the people that build them are poor. 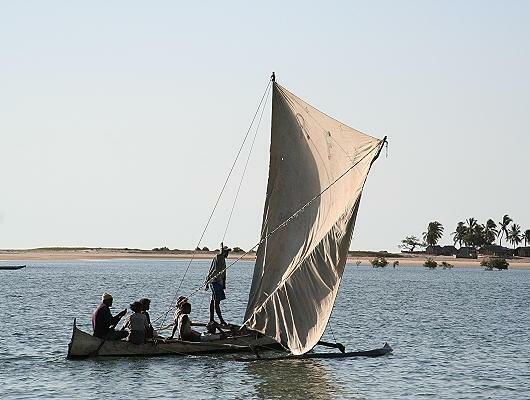 They do not have the money to buy sawn timber, or synthetic sail cloth. Instead they make use of branches for poles, outriggers and crossbeams. 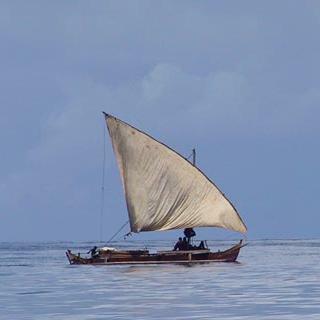 They seem to be using cheap cloth as sails. 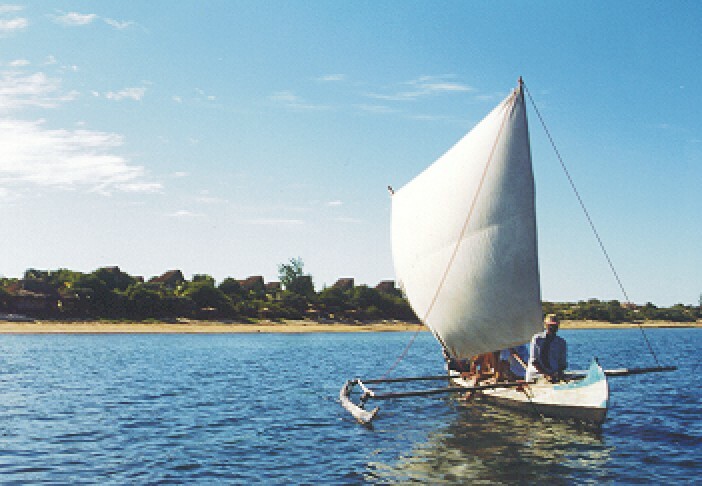 Although not 'refined' in western terms, these craft appear very common in Madagascar, indicating that they are a very successful design. It seems that the craft gives a lot of vessel for the the money invested. It goes without saying that these are relatively easily built and beachable. Given the lack of money available to those that use them, these craft appear most impressive indeed. A short aside, my understanding is that Madagascar was first colonised from Indonesia only 1000 years ago, and not from nearby Africa. The exact craft that was used for this colonisation is unknown, but it may well have been tacking outriggers! There is a webpage that deals with this colonisation, and is called the Borobudor ship. According to the website they belive it was done with a vessel with dual outriggers (not my guess, but I could be wrong) Their website can be found HERE.